The Peter Lynn Lynx depower foil is your ticket to endless fresh powder snowkite sessions and unlimited backcountry adventures. It’s forgiving nature and ease of use makes it the perfect snowkite for riders of all skill levels. Starters will appreciate the kites smooth & constant power delivery and superb stability. Intermediate riders will enjoy the kite’s acceleration and excellent response through the control bar and even advanced riders will be amazed by the kites performance in the more challenging conditions. 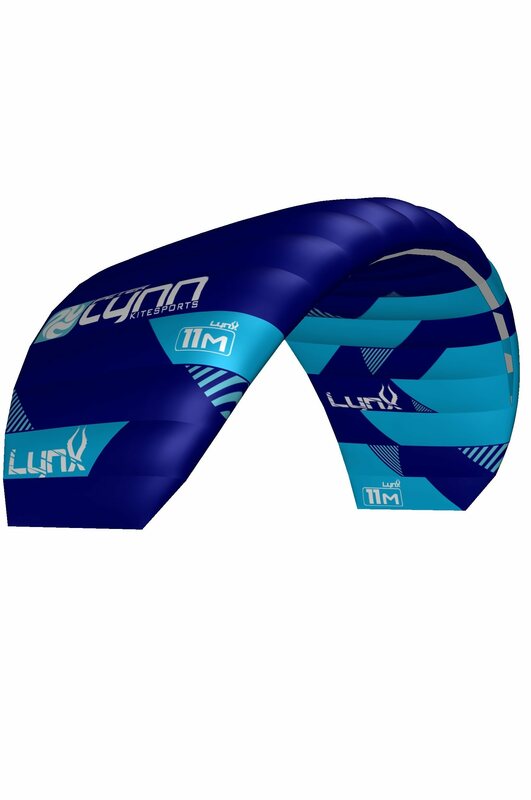 The Lynx has been developed with the highest quality materials and state of the art production techniques as an “all-round” cruising kite that will have you ride comfortably for hours. Peter Lynn’s famous stability paired with a perfectly balanced Aspect Ratio results in a kite that is easy to control yet agile enough to keep you smiling for many sessions to come. The Peter Lynn Lynx 9m2 2014 has been tested in true backcountry snow kite conditions. At elevations between 2000 and 3000 meter and wind varying from 1 till 4 bft. The Lynx felt comfortable right away and gave the right pull according to the bar pressure. For a 9m2 the reaction wasn't very fast and the kiteloop for going uphill was slightly big for a 9m2. On the other hand behaved the Lynx very well in gusts and wind gasps as long as you pull the bar a little bit. The Depower works perfect although the rest pressure left when depowered might be quitte a lot for lightweight riders. The safety system in cold conditions isn't ideal, when trying to release with mittens. Resume: a stable kite perfect for touring, comes in a handy bag which only lacks a cheststrap. Tested the new 5m depower Lynx in the snow and on land (boarding) with my son (30 kg). I liked the stability and speed in combination with controllable power. The boost and lift is pretty gradual so it won't lift or pull him out of his socks. On the edge of the wind window there is a pretty strong pressure (grunt), that gives a good feedback and in his low end (8-10 knots) enough pressure for Snowkiting (flat parts or Landboarding (hard ground). The 5m lynx has a short depower stroke. So you depower in a short arm movement, great for kids arm length. But the characteristic: steering with slacked lines can be better, the lynx doesn't react so well when totally depowered. That characteristic makes it usable range a little smaller. You can play with the line length (more wind smaller lines) to make the wind range a little better. Overall a good and payable depower foil kite for kids. Kids that use the wind to ride and slide around on land. The Peter Lynn Lynx kites responded to my steering as I wanted : direct, safe and stable, fast but not too aggressive like a bullet and with a large wind range. A real workhorse that offers a lot of potential to beginners and intermediate snowkiters ! When I launched the kite, I felt immediately comfortable with it.